When searching for the right tools for the job, you often end up on the website of a company offering a (range of) commercial plugins(s) that is suited to the task. Sometimes though, if you only need subsets of the plugin's functionality, you can find free tools that equally well suited. That's the reason for this roundup. 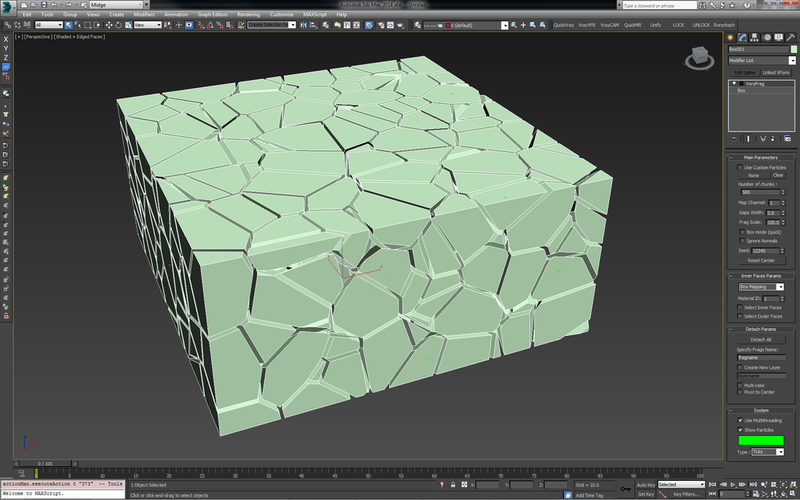 When it comes to fracturing objects in 3ds Max there's a wide variety of tools available to you... for free! Rather than focusing on the big well-known commercial plugins such as RayFire or Volumebreaker, I'd like to give you an idea of what you can find if you look around a bit on a website such as ScriptSpot, which provides a plethora of free and commercial scripts and plugins for 3ds Max. This roundup is still only a selection of what you can find for free, based on my personal experience with these great tools. With that said, it's time to get down to business. This script by user Garp on ScriptSpot has been around for quite some time. A lot of 3ds Max VFX tutorials on the web use this script as their preferred quick fracturing solution. The interface is very self explanatory, which makes it fast and easy to use. If I'm ever in need of quick, basic fracturing I find myself coming back to this script quite a bit. You can find it here. Also, Louis Marcoux made a variant of this script where it fractures the currently selected objects, rather than the picked object. That version can be found for download here. BONUS: The page also contains a great 3 part tutorial on how to blow stuff up in 3ds Max. More a plugin than a script, this great tool by user LittleLordPotala works a little different than the other two featured items in this list. It's a modifier which can be applied to all kinds of objects in 3ds Max, effectively giving you the option to procedurally fracture objects and retain control down the line. VoroFrag also comes bundled with a user manual in PDF format, and LittleLordPotala has also made a few videos showcasing its features so you can get started with it right away! Get it here. An example of some of the newer VoroFrag features. A screenshot of VoroFrag applied to a box, showing it's interface and the real-time view of the object being fractured. As the name suggests, this script by user Jbond is quite fully featured indeed. If you've ever used RayFire, Advanced Fragmenter will definitely look familiar. One could say a fair amount of design decisions regarding the interface (and some other features) have been "inspired" by its commercial counterpart. All jokes aside though, this script has a lot to offer in terms of functionality. Not just all kinds of custom and automatic fracturing, but also things like bullet holes, a bunch of mesh cleanup utilities and even a history where you can hide, unhide and delete individual layers of fractured geometry. One thing to note at the moment is that Advanced Fragmenter is currently at version 1.0, so some things still need to be smoothed out. For example, part of installing the script requires copying some icons to a hidden system (sub)folder. There also exists a dependency on iToo Software's free Clone modifier, which will have to be installed to access the cloning functions in the Modifiers Tab. Also, with all its functionality, it would be nice to have seen some kind of user manual, as at first it can be a bit daunting trying to figure out what every button does. These are just minor gripes though, because once you get used to the interface, experimenting is easy and a lot of fun. The Fragment Tab contains all the basic controls for quick and custom fragmentation. You can easily just break up your geometry in a certain amount of chunks or really get down and dirty with the look you're after by using a custom cutter shape. Custom fragmentation is a breeze thanks to a dedicated interface in the Modifiers Tab, where you can tweak and clone your slicing geometry by adding modifiers via a custom interface. This is great for when you need precise control of how the fragments should look. There's even controls for freehand drawing a shape in the viewport to create your custom shape. The Post Tab allows you to quickly iterate by removing or hiding fragmentation layers. The Advanced Tab has options for creating bullet holes, down to the creation and control of a custom shape for the holes themselves. The Pro Tab allows you to use helpers and existing scene geometry to fragment your objects. And finally, the Utilities Tab allows you to clean up your fractured geometry. Advanced Fragmenter has a lot more to offer than what I just glossed over here, so definitely have a look at what it can do. To get started, there's a few videos supplied by the creator of the script, which give you a nice overview of what's possible with it. There's still a few bugs present as it's version 1.0, so be wary of course, but don't let it spoil your fun as you get to know the ins and outs of this great free script. You can find it on the ScriptSpot page here. Free vase model broken easily with VoroFrag. Taping it back together proved to be the hard part. Keeping an eye out for scripts such as these can really help you create some amazing work, without adding additional cost to production. Like I mentioned before, these are just three scripts I hand-picked because I use them every now and then. There's many more great free tools like these available, and the 3ds Max scripting community is very active in a lot of places. I hope you enjoyed reading this article and wish you a lot of fun experimenting! A big shoutout to the creators of these fantastic tools: Garp, LittleLordPotala and Jbond. Be sure to check out all their other stuff as well!